The average cost of a funeral is more than $6,500, according to industry analysts. This figure includes only funeral home costs; cemetery, florist and obituary costs can add thousands more. Many people go into debt burying a loved one because they are unable to pay these costs out of pocket. 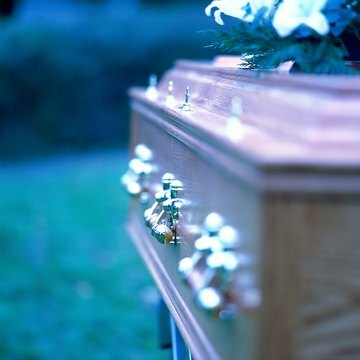 If funeral-related debt has overwhelmed you, you can likely wipe it out in bankruptcy, depending on the circumstances. People file for bankruptcy to stop creditor harassment and wipe out their obligation to pay the debts they owe. The wiping out of a debt obligation in bankruptcy is called a discharge and occurs at the end of a bankruptcy. In a Chapter 7 bankruptcy, which is primarily available to people with low incomes and without many valuable belongings, the discharge occurs mere months after filing. In a Chapter 13 bankruptcy, the discharge applies to eligible debt that remains after the filer has completed a three- to five-year repayment plan. Not all debts can be discharged. The Bankruptcy Code excludes certain debts from discharge eligibility, like student loans and child support payments. Funeral expenses are not on that list, so under normal circumstances, debts incurred to pay for a funeral can be discharged. However, only the debt of the person filing for bankruptcy may be discharged. Therefore, you cannot file bankruptcy to get rid of debts incurred by someone else to pay for a funeral -- even if that person is an extended family member. In most circumstances, funeral expenses are unsecured debts that may be discharged in bankruptcy without further steps or repercussions. For example, if you pay funeral costs with a credit card, borrow money from a friend or take out a loan, your obligation to pay those debts ends with your discharge. These are methods people often use to pay funeral home expenses because funeral homes normally demand payment up front for the services and products they provide. However, people sometimes take out a loan to pay for a cemetery plot that is secured by the plot itself. If you enter into an arrangement like this and subsequently file for bankruptcy, the lender may repossess your cemetery plot. A cosigner on a loan is just as responsible for repayment as the primary borrower. The only difference is that the lender agrees to collect from the cosigner only if the primary borrower doesn't pay. When someone receives a discharge in bankruptcy, what is wiped out is that person's obligation to pay his debts, not the debts themselves. As a result, if anyone else is obligated to pay any of those debts, the lender has a right to attempt collection from that person. When a death occurs, family members or friends may seek to be helpful by cosigning a loan to help finance the funeral. However, keep in mind that if you file for bankruptcy on a loan with a cosigner, the lender has the right to attempt collection from the cosigner when it can no longer collect from you.